Location: The W part of the surviving Priory church, on the E side of the Priory complex, on S bank of Ewenny River, NE of Ewenny Village and N of Corntown. William de Londres (d 1126) of Ogmore Castle built a church at Ewenny which was consecrated by Bishop Urban of Llandaff (1107-34). 1141 William's son Maurice de Londres confirmed the gift to St Peter's Abbey Gloucester (now the Cathedral) of the churches of Ewenny, St Brides Major and Ogmore Chapel with all their possessions 'in order that a convent of monks might be formed'. Maurice was buried in the Abbey and his still surviving tombstone calls him the founder. C A Raleigh Radford explained this gap in dating by proposing an initial church pre-1126 enlarged for monastic use after 1141, though architectural evidence suggests a date for the whole building in 1120s, the style deriving from Gloucester, as propounded by M Thurlby. Main fabric is C12; S porch and N aisle C16. After Dissolution E part was neglected, W part, W of chancel arch, used as parish church. W bay of nave removed c1803 with its doorway resited in garden of Ewenny Priory (house). Nave repaired and aisle rebuilt 1895-6 by J T Micklethwaite under Thomas Turbervill. Romanesque. Of stone rubble formerly lime rendered with ashlar dresings and Welsh slate roof. Plan of nave, N aisle and N porch. N side faces churchyard; W and S are within the grounds of Ewenny Priory (house) as is the ruined W bay of nave; E adjoins the Priory crossing and chancel in separate ownership. Gabled N porch has wide roll moulded 4 centred arched doorway under a square headed hoodmould; segmental arched inner doorway has hollow chamfers stopped at base, no capitals. Three long and narrow round headed windows to clerestorey N and S; N aisle windows are triple (E) and quadruple (W) round headed lights with hollow chamfers in a square headed frame with hoodmould. 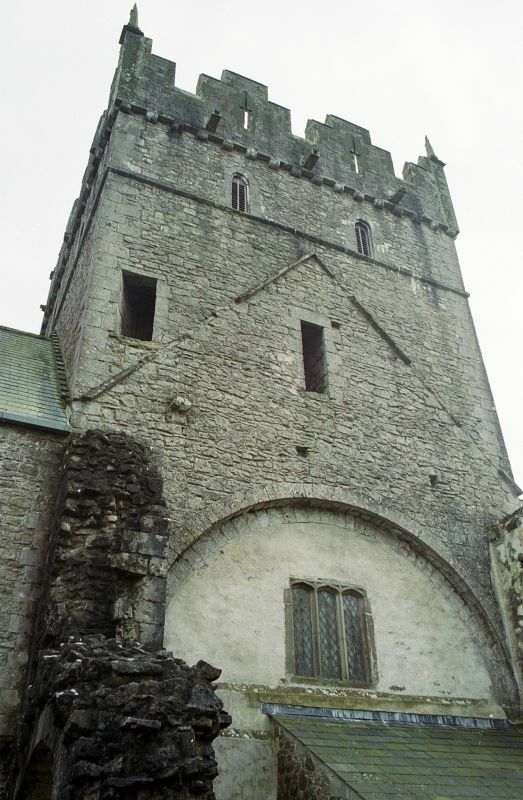 S side has 2 light square headed window above a Romanesque doorway at SE end of nave, formerly the monks processional entry and adjacent to a similar doorway into the Priory S transept; this doorway is of 2 orders, the outer strongly billet-moulded with plain imposts. W end now slate hung following early C19 remodelling. Churchyard to N bounded by low rubble wall; entrance NW has iron lamp arch to gate piers. Interior is limeplastered with exposed dressings. Nave is high with deep splays to the clerestory windows above spandrels to S and N arcades. Four bay N arcade has massive cylindrical piers with plain unchamfered double order arches with moulded plinths on square bases and fluted capitals; at SW the E section of blocked window visible where W wall rebuilt and at NW arcade stops short of W wall; deep recess in middle pier and grooves in others. Aisle windows have deep hollow chamfers, diamond quarries and iron armatures; at NW two 4 centred arched lights in a square frame; at SE a square headed window with damaged mullion, rectangular quarries, armature. Chancel arch also has 2 orders with a pair of attached half round columns with lightly scalloped capitals; below is a pulpitum with pointed arched now blocked doorways at N and S, the former with an inner order; above is the partition separating church in use from E priory church. At NE a round arched doorway with hood mould; some medieval tiles on floor here; at E end of S wall a tall round headed doorway to former monastic range Stone floor to nave; one step then 3 to present sanctuary, floored with ledger slabs. Boarded nave roof all replaced; corbels to N aisle roof show a former different roof pitch, this repair work to nave and rebuilding of aisle by Thomas Picton Turbervill recorded in the metal inscription plaque adjacent. Chalice shaped font with narrow roll moulding on a splayed base with no stem; modest C18 wall monuments and memorial to those who served in 1914-18 war; nave door has some old metal fittings. Listed grade I together with the Priory attached E as an outstanding example of Romanesque Norman architecture in Wales. Group value with all other buildings at Ewenny Priory especially the Priory Church. The E part of the surviving Priory complex, on the S bank of the Ewenny River, NE of Ewenny village and due N of Corntown, bordered by Ewenny Priory (house) gardens to S and churchyard N.
On the E side of the Stable Court, backing onto the Priory churchyard wall and adjacent to the W wing of Ewenny Priory (house). Section of wall linking N tower and NW wall of Priory, acting also as boundary wall for Ewenny Priory Stable Court. About 1km NE of Ewenny village, to S of Ewenny Priory to which house is attached. Forms the NE boundary of the Stable Court to Ewenny Priory (house), the main entrance now passing between this building and the barn. Aligned roughly N/S in Ewenny Priory (house) garden, joining churchyard at SE and former SE gatehouse. The gateway forms the entrance to the main garden from the Stable Court at the rear of Ewenny Priory (house). On the N side of the Priory complex, facing Abbey Road and Ewenny River, close to the Priory churchyard and backing onto the Stable Court of Ewenny Priory (house).